Getting there: We're describing a way to get to the parking under the MoPac bridge here because at the time of the hike all of the parking around Auditorium Shores were taken up by construction. From MoPac, take the Bee Caves Road exit (Hwy 2244). Take a U-turn at the light and head back towards Zilker Park. Upon passing the Zilker Botanical Garden on the left take the next left. The soccer fields should be on your right as you continue down the road, which will turn to the left and then head to the MoPac bridge over Lady Bird Lake. 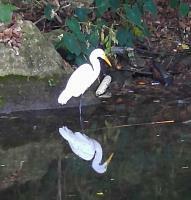 There is ample parking around and under MoPac bridge and this is right next to the hike and bike trail. The Hike: The Lady Bird Lake Hike and Bike Trail (long known as the Town Lake Hike and Bike Trail) is the most used trail in Austin. So if you're looking for a place of quiet and solitude, look elsewhere. If you're looking for pleasant, mostly flat, walk with several excellent views of downtown Austin and Lady Bird Lake, then Lady Bird Lake may fit the bill. Although the stated distance for this hike is 7.2 miles, you can choose a different turnaround point to cut the hike to 4 miles. We're showing you almost the complete trail here, including the lesser used portions of the trail to the east of Congress Avenue. 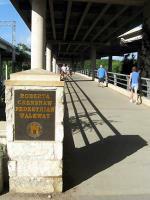 The starting point for our hike was under the MoPac bridge on the southern side of Lady Bird Lake. We headed east back towards the heart of Zilker Park. On a few occassions you can see the soccer fields to the right. At the waypoint marked, "Train", you'll cross the narrow gauge railroad tracks that carry the Zilker Train that has delighted kids for years. There's also a water fountain at this spot, in case you're thirsty. The trail becomes more tree-covered from this point through the waypoint marked, "Lou Neff Point". 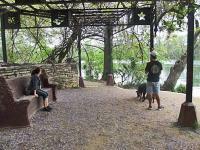 There is a gazebo here right at the confluence of Barton Springs and Lady Bird Lake. There are some good views here, a water fountain and strip of waterfront just to the south where people like to feed the ducks. The trail heads south, away from Lady Bird Lake, for a moment and crosses over an arched footbridge before heading north again back to the Lady Bird Lake shore. Once back to the shore the trail turns to the east again towards Lamar Blvd. Lamar Blvd. used to have sidewalks for pedestrians, but several accidents caused the sidewalks to be closed and a new pedestrian bridge being built. You can see the construction going on at the waypoint marked, "New Bridge". Lady Bird Lake cuts through the heart of downtown Austin. As the trail approaches Congress Avenue the park area along the shore is known as Auditorium Shores. Several events and concerts are held in this area every year. At the waypoint marked, "SRV", you can find a statue of Stevie Ray Vaughn, a musician who made his home in Austin and was killed in a helicopter crash. The waypoint "Mile 0" is the start of the trail mile markers, which we are running against at this point. This is also very close to the Congress Avenue crossover point if you want to take a short trip of 4 miles back to the trailhead. The trail on the other side of Congress is less used and will eventually run into an apartment complex at the point marked, "Trail End". It's not the end of our hike though, as we work our way towards Riverside Drive and continue to head east to I-35. The sidewalk here is right next to the roadway where cars are steaming by at a high rate of speed. To make matters worse, the only "steep" hill is in this section of the hike. Right before you get to I-35 there is a Dog Park, marked with a waypoint of the same name, on the left. Inside this large fenced area you can let your canine friend roam free with lots of other dogs. I-35 contains a separated pedestrian crossing which gets you back to the north side of Lady Bird Lake. Now the trail heads west and we're back to trees and grass and not cars and streets. This section of the trail is less used and provides a bit more peace and quiet than further west. The waypoint marked, "5th", is where you will find two historical markers. The first is an indication that on that spot the 5th military district was headquartered after the Civil War. The second indicates that on that spot, the first use of Barbed Wire took place. 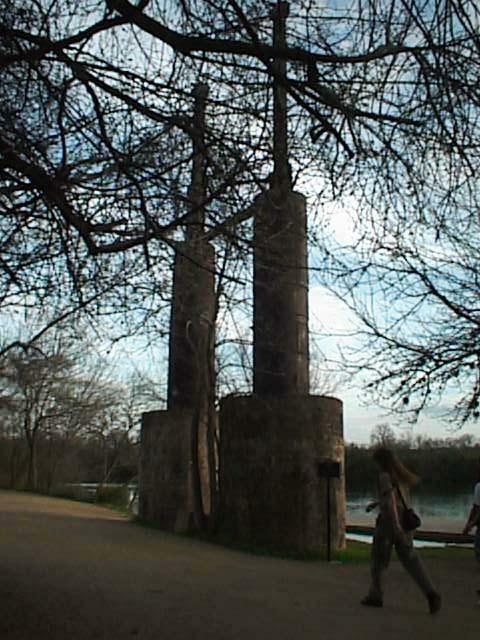 This tower was used as part of an effort to quarry clay from the Zilker Park area. The trail continues to head west through downtown Austin, the face of which is changing by the day. 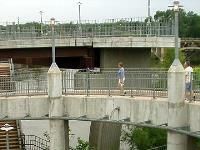 Once you cross under the Congress Avenue bridge you'll encounter many more walkers, runners and bicyclists. 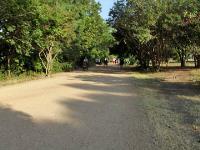 Lady Bird Lake's trail does provide a few feeder trails that are ripe for exploration. One of the best is the Shoal Creek trail, the start of which is marked by the waypoint, "Shoal Creek". That trail heads north for 3 miles and will be highlighted in a separate page later. Lady Bird Lake has not always been a recreational site. The waypoint "Clay Tower" marks the point of a large concrete and iron structure that was used to ferry clay from the southern shore of the Colorado river. At one time there was a brick factory nearby this location. 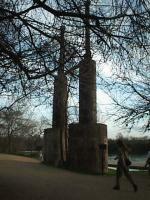 This is the only tower remaining of three originally built and was in use from 1902 - 1942. You can read more about it on Austin Explorer's Long Gone Austin page. By this point, the hike is all but over. 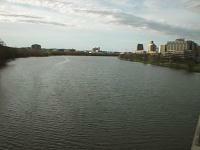 All that remains is to cross Town Lake on the pedestrian bridge under MoPac and the circle is complete. Town Lake was renamed in honor of Lady Bird Johnson on Monday, August 6, 2007. Lady Bird was actually instrumental in getting the area around Town lake transformed from an unsightly flood zone into a recreational centerpiece for the city, so it seems a fitting tribute. (1) It's a heck of a lot less crowded than the main stretch of the trail, east of Mopac, with a somewhat more chill vibe. (2) You get to walk on the lovely boardwalks that the city constructed over the lake. You can get an ~4-mile walk between Guerrero Park and East Bouldin Creek, including some really nice lake and city views. Not a lot of shade, but for an after-work walk, that's not so important. Great for runs. Get there early! My dad, his friend, and I all met up at this trail to run this morning. We parked under Mopac (them along the street, me in the parking lot that is reserved for Austin High during the week) around 6:30 am on a Sunday and while there were many cars already it wasn't full close to full. When we finished nearly two hours later, this had changed: It was packed in the area we had parked. Needless to say, this isn't a place to go for solitude, but I like it because it's fun to see everyone out enjoying the area differently (walking, running/jogging, biking, boating). Our mileage varies from the one shown on here because with the addition of the Boardwalk we were able to run all the way to Pleasant Valley and cross on the dam. After crossing the dam is the area with a couple of murals (mentioned above), so it's worth it to do these extra miles, both for the fitness and the sights. The trail is easy, mostly granite gravel with a few paved parts. It's really nice to run on. There are a lot of neat sights, such as good vantage points of the downtown skyline, sculptures, the Stevie statue, and and some cool graffiti murals. 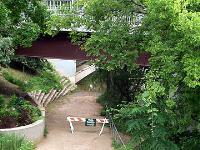 We walked from Mopac to S 1st and back again--a very pretty hike--the bridges offer lovely views of downtown. But the trail is REALLY popular, to a degree that can be rather off-putting. However, for those looking to squeeze in an after-work hike before sundown during the short days of winter, it's too convenient to pass up. And if you're a woman hiking alone, those crowds do represent safety, so that's a plus as well. We did not walk the complete loop. We walked from the Congress Street Bridge to Pleasant Valley Road. About a fourth of the distance of that on a boardwalk. My annual hike & bike b-day loop! This has become a b-day tradition - taking a day off from the office and going to explore the good old hike & bike trail. I usually start at Deep Eddy or under MoPac bridge, cross to the south bank, cross again on Pleasant Valley bridge, and get back to Depp Eddy. The new boardwalk was not open yet when I did my 2014 loop (that was in February), but I read online it will be open June 2014. I love this trail; it was the first I hiked when I came to Austin back in 2002 and it's always nice to come back, even just for a short section, either for a run or a ride or a walk! Hiked loop from Mopac trail head to Lamar bridge. Dusty. Good place to go after rain. This time we walked it with our kids. Did another loop around the lake. Just learned they changed the name of the lake from Town Lake to Lady Bird Johnson Lake. Trail is still the same great trail no matter what the name. Every Town Needs a Trail celebrates the lore and heritage of Austin s Town Lake Hike and Bike Trail that was inspired by the vision and leadership of Mrs. Lady Bird Johnson. It is a cultural story, a scenic story, an environmental story, and a universal story about the deep need in all of us to maintain and cherish our nation s open spaces, which in turn, shape the essence of our very own being. 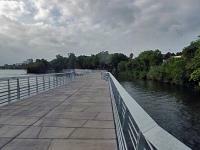 Since that groundbreaking December day in 1971, when Lady Bird began her quiet legacy of helping create a simple walking path along the banks of the Colorado River, the Town Lake Trail has transformed into one of Austin s most beloved resources. It elevates its residents and visitors alike with its tranquility, inspires with its calmness, and galvanizes an entire city with its energy and beauty. Every Town Needs a Trail features inspirational interviews with some of Austin s most distinguished residents over the past three decades who are among the thousands of people who have enjoyed the Trail on a daily basis, along with beautiful scenic photographs of the Trail by Russ Ohlson, Brenda Lindfors and friends of the Trail. Experience the magic of the Town Lake Trail. Share in the wisdom of some of its most inspirational residents. 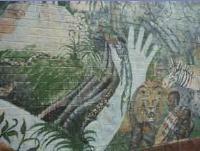 Enjoy the story about a Trail with an amazing past, a vibrant present and the hope of a perpetual future. The following pages will be your guide along the path of Austin's crown jewel -- a path to live by and a place to be well.